The Space Based Infrared Systems program office directed the contractor team to implement a revised ground delivery strategy and timeline through a contract modification Monday, April 4. The Block 10 modification delivers the first operational baseline capable of controlling and processing data from the legacy Defense Support Program satellites as well as from the new SBIRS sensors from a single operational control center. In addition to providing sufficient capability to retire the existing ground system, Block 10's updated architecture provides a broad spectrum of capability to various SBIRS users. The Block 10 design will enable independent evolution of products for each mission area, rapid capability insertion for users and integrated processing of the geosynchronous orbit, highly elliptical orbit, and DSP sensor data. Block 10 also fields a prototype services-oriented architecture to allow more timely and efficient distribution of SBIRS data to a wider Defense Department customer base. This revised strategy was developed in concert with the users and provides a robust data processing and dissemination ground system using technology and tools not available when the original ground delivery strategy was approved. In preparation for the Block 10 activity, the Government and contractor performed an executive preliminary design review focusing on system requirements/verification, scenario development, models and simulations, technical performance measures, system performance, information assurance/security, system test, and the ground segment architecture. The executive PDR demonstrated that the contractor has performed substantive, sound technical work on the Block 10 high-level design and was ready to continue with detailed design. 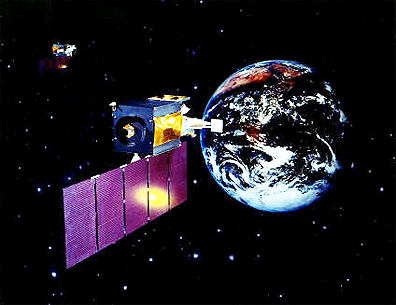 The SBIRS program is designed to consolidate operational military and technical intelligence Overhead Persistent Infrared requirements into a single space program. The SBIRS space assets provide Overhead Persistent Infrared capability that contribute to user requirements in four distinct mission areas: Missile Warning, Missile Defense, Technical Intelligence and Battle Space Awareness. The SBIRS ground stations and communications infrastructure receive, process and disseminate the data to a broad spectrum of users. The SBIRS team is led by the Infrared Space Systems Directorate at the U.S. Air Force Space and Missile Systems Center, Los Angeles Air Force Base, Calif. Lockheed Martin Space Systems Company, Sunnyvale, Calif., is the SBIRS prime contractor, with Northrop Grumman Electronic Systems, Azusa, Calif., as the payload subcontractor and Lockheed Martin Information Systems & Global Services in Boulder, Colo., as the ground system subcontractor.